Is the Evodash SVA approved? What are the Fascia options? Can I alter anything else? What is the thread size on the temperature sensor? How can I order spares? I don't live in the UK, can I order an Evodash? Can I get an Evodash in kph? I've got a sequential motorbike gearbox, will the Evodash work with it? Where do I mount the speed sensor? How does the fuel gauge display the status? Do I need a PC so set up the Evodash? Does the engine need an ECU? Yes the Evodash will meet the UK SVA requirements, assuming it is fitted correctly and calibrated according to our instructions. It has the required lights, speed units and odometer to meet the legislation. There are currently two options for the fascia; Aluminium and Carbon Fibre. We can provide a custom milling service to allow fitting into your dashboard. Your material must be flat and accessible from both sides in the area that the Evodash is to be fitted. email us to discuss suitability and pricing. Yes! The buttons can be individually changed to Red, Yellow, Black, Green or Grey by special request. The LEDs can also be changed to a Blue colour theme. Call us or email for current pricing on spares. Yes - we can post to most parts of the world. Contact us to find out about overseas postage rates. 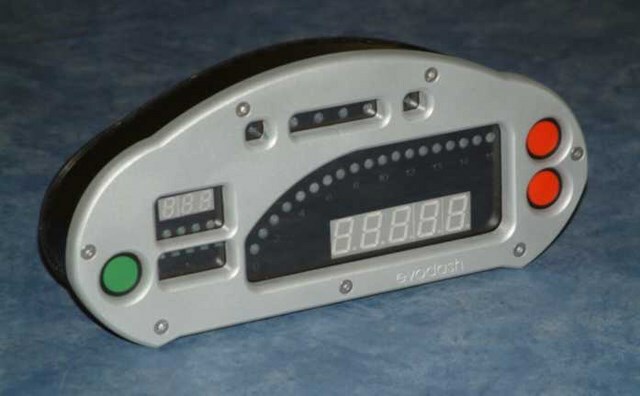 A standard Evodash can be configured in software to read in mph or kph - no need to order a special unit. Yes. There is an Auxiliary LED on the dash that may be wired for any use - typically it will be used to show when you are in neutral. It does not have a gear indicator. The speed sensor is mounted on the driveline after the gearbox. Typically people mount it next to one of the universal joints to detect the 4 bolts as they go round. The speed sensor detects metal - no need to glue little magnets on to any fast moving parts for them to fly off! In the software setup on the Evodash you tell it how many pulses it gets per rev of the driveline and the circumference of the wheel. The engine revs are detected separately. The fuel gauge measures fractions of full; the empty and full positions are calibrated to your sender and it works out the values in between. No, all of the setup is done through the menu system in the Evodash itself. No, you can pick up the revs from an ECU or the negative side of the coil pack. The Evodash, customised to your specification, dash wiring loom, oil pressure sensor, temperature sensor and speed sensor. Also included is a detailed set of instructions on how to install, calibrate and use the Evodash. No it is not waterproof, but it will survive occasional light showers. Copyright © Evodash 2009 - 2018. All rights reserved.